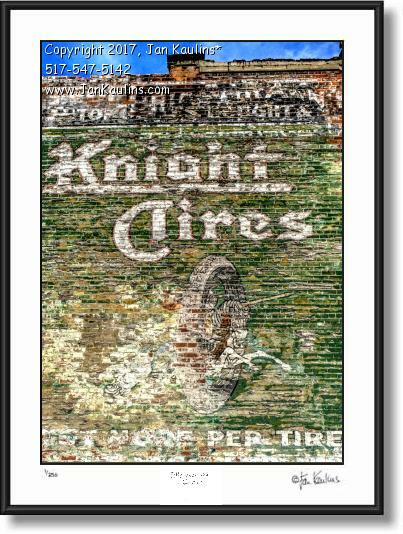 DETROIT GHOST SIGN photo picture art print for sale of KNIGHT TIRES Detroit Ghost Sign photo picture art print for sale. This is a very old and very unique KNIGHT TIRES Detroit Ghost Sign. A couple of years ago a building adjacent to this sign was torn down revealing this extremely rare advertising image of the KNIGHT TIRES COMPANY of Detroit with faded graphics of a Knight in Armour on his white horse with his lance extended forward charging through the center of a white 1920's tire. Apparently this image had been on this wall for along time before it was covered up by the other building as can be seen by how faded and weather worn the graphics are. Very little is know about The Knight Tire Company and this is the only large wall size mural that I have been able to find any record of. It's a wonderful visual image of the very early days in Detroit automotive history. Each photograph in this series has been created from nine separate photographic digital exposures and then layered together into one photographic image. It is then ‘tone-mapped’ where individual areas of the photo, as well as contrast, saturation and other qualities of the image can be artistically manipulated to bring out the artistic effects that make these photos so visually unique and striking. Some of the photos in this series are even further enhanced for artistic effect giving them an almost painterly or graphic silkscreened look.